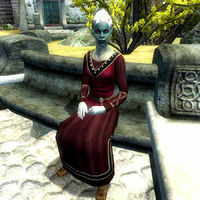 Arvena Thelas is a Dunmer commoner living in Anvil. Word on the streets suggests that Arvena keeps strange things in her basement, but according to Arvena, there's nothing strange about the four rats she keeps as house pets. Regardless, one of her neighbors is bothered by the mere thought of living next door to a bunch of rats and during the related quest, you'll have to sort things out. She's known around town as "the rat lady," but Arvena chooses to ignore that and actually spends several hours socializing with her fellow townsfolk. She gets out of bed every morning at 6am and spends two hours in the house before leaving for breakfast at The Count's Arms. At 10am, she heads for the shady bench underneath the big oak near the Anvil Dock Gate. Once seated, she reads the book Biography of Barenziah, v 2 until 4pm when she returns home. At 6pm, she once again enters The Count's Arms, unknowingly eating her dinner alongside the very person responsible for her rat problem. She heads back to the house at 8pm and wanders around there until it's time to go to bed at 10pm. On rainy days, she will skip reading on the bench and head straight back to her house. During the related quest, she will cancel all appointments and just stroll around on the second floor of her house, eagerly awaiting news from you. She wears a set of common middle-class clothing, including a burgundy linen shirt, a pair of burgundy linens, and pigskin shoes. She carries her copy of Biography of Barenziah, v 2, her house key, and a leveled amount of gold. The very first time you approach her, she will politely introduce herself: "I'm Arvena Thelas. They call me 'the rat lady' on account of all my pet rats." If you ask her about Anvil, she will reflect on the increasing amount of rumors around town: "You can't imagine the fuss some people make. My rats are no problem for anyone." At Azzan's request you'll have to find Arvena right away, and when you do so, she will fill you in on her special relationship with her unusual house pets: "Ah... you must be from the Fighters Guild. Good. I have a problem, it has to do with the rats my basement. That's right. Rats. In my basement. And something has been killing them! It's horrible. My poor babies! You must do something! I don't know what I'd do without them. Their little pink noses, their scaly little tails. Please, get to the basement and find out what's happening." Speaking to her again before dealing with the problems in the basement will have her say "Aren't you going to take care of this? What am I paying you for?" After investigating the basement and discovering the mountain lions, reporting back to her will have her greet you with "Well, what have you found? Did you take care of my babies? What was going on down there?" After informing her that mountain lions are in her basement she will say "A mountain lion? In my basement? But... how? That's not possible. But, it happened! What if there are more? What if it wasn't alone? Where there's one, there will be more. Find Pinarus Inventius. He's a hunter, and knows this area inside and out. He'll know what to do." Speaking to her again will have her greet you with the line "You should be looking for Pinarus! What are you doing here?" At the end of the quest, the person responsible for the whole mess with the mountain lions will make you an offer: either tell Arvena about her, or don't. If you choose to tell Arvena the truth, she will give you a lesson in Speechcraft and say: "I knew it! That s'wit! Oh, I'll get her. You just wait! Must have taken some fast talking to get her to confess! Maybe I can teach you a little bit more about how to talk to people. And, of course, here's the payment for the contract. Thank you." If you choose not to tell her the truth, you'll receive only the gold reward as well as the following dialogue: "She didn't, huh? Hmph. But, you've taken care of the problem, and I suppose that's what counts. Thanks for that. Here's your payment." Also, if all of her rats die during the quest, she will not hesitate to cancel the contract: "My rats are all dead! It's too late to do any more. I won't be needing your services any longer." After this, she will greet you contemptuously: "Useless Fighters Guild. What do you want?" If you succeed with the quest, she will greet you in a totally different manner: "Thank you for all your help. My rats appreciate it." Other people will share rumors about her: "Arvena Thelas is an odd one. I've heard some strange noises coming from her basement." and "Something about Arvena Thelas is a bit odd. I've heard she keeps strange things in her basement." Others will say: "That woman is a bit off-kilter. I don't even want to know what she's got in her basement." and "She's a nut. Whatever's going on in that house, I don't want to know about it." 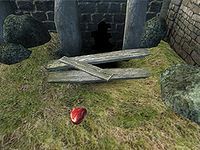 During the quest, Pinarus Inventius will reveal that he shares the public opinion: "A hunt will do us good, and maybe make that old nut feel better." This page was last modified on 17 June 2018, at 11:49.